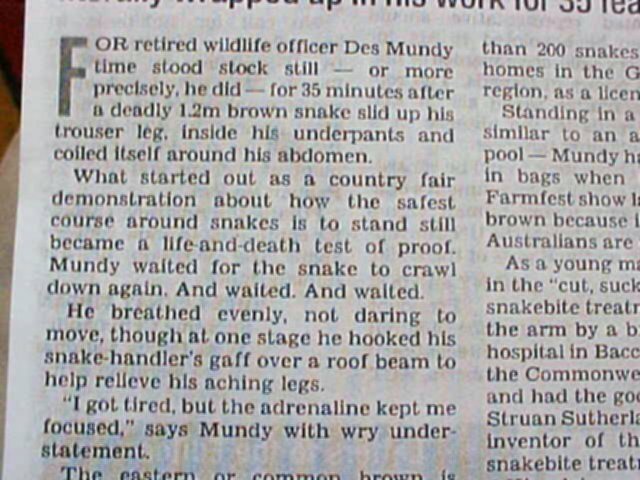 Lately, on a county fair, snake handler Des Mundy lost control of a very dangerous snake and it glided into his pants, where it comfy sat for some thirty minutes, before coming out at the other leg. Des stayed calm, gave the good example to the audience, but outside the tent an emergency helicopter stood by to take him along when the snake would bite him. He was very lucky that nothing happened. But one bit would have probably killed him before arriving at the hospital. Mark woke me up this morning, telling me I have a visitor for me. Outside on the sunny veranda of the wooden house I met Des Mundy, known as the local snake handler. Des had heard about me and wanted to say hi to me. 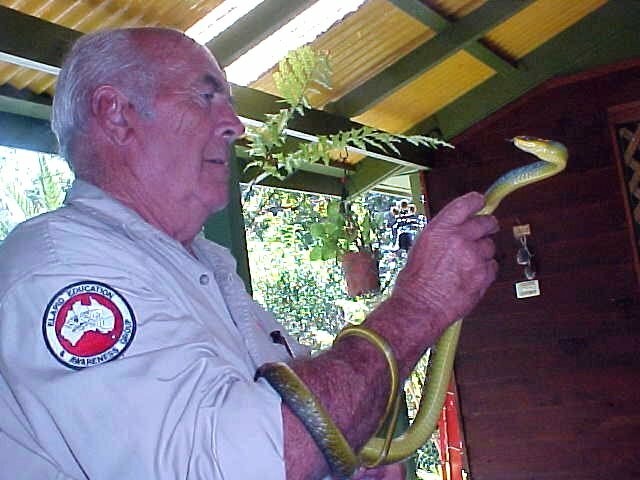 Des Mundy has had a lifetime of "hands on" practical experience in the Australian Bush and Outback and has extensive knowledge of Australia's Aboriginal Culture and native fauna with special interest in venomous snakes. He has the unenviable task of removing over three hundred snakes each year from people's homes - he has removed snakes from baby cots, bathrooms, kitchen cabinets and on television sets. As a snake handler Des is understandably a very important person to all the people here. Del and Mark learned to know him after they have a few snakes in the roof above the bathroom. Every now and then they�d see this head appear, with that snaeky little tongue, through a little hole. Good morning! Since then Des comes by for a cup of coffee or, like today, joined for a morning breakfast at the Newport�s. Des loves to talk about these reptiles. He has a weekly chat on the radio and answers questions from listeners. Next to radio he also gives demonstrations about snakes and what to do with them if you see them. Lately, on a county fair, he lost control of a very dangerous snake and it glided into his pants, where it comfy sat for some thirty minutes, before coming out at the other leg. Des stayed calm, gave the good example, but outside the emergency helicopter stood by to take him along when the snake would bite him. He was very lucky that nothing happened. But one bit would have probably killed him before arriving at the hospital. After breakfast Des had to go again and I typed away on my reports. It was around 12.30am that Mark took me along to a friend of him in Bilambil. This friend was massage therapist Dennis and Mark thought it would be very good to me to have a thoroughgoing massage after all those days of travels, for free � as Mark paid Dennis to give me a full hour massage. And there I was, moaning away with little pains as Dennis found and removed knots in my back and legs. Afterwards I felt reborn and ready to get going again. Suddenly my 25kg backpack didn�t feel that heavy anymore! From the therapist to home, Mark drove around the valley lands of Bilambil and showed me the coffee bean farms and the mango plants. In the distance I could see the sky scrapers of beach town Surfers Paradise (yes, it�s really called like that�). My next place to go was in Fingal Heads, only some twenty minutes away from Bilambil, at the same place where Mark took me yesterday, at that sharky beachfront. For Mark it was nothing, so he dropped me off at the right address and I met up with my next hostess Ann Eglitzky, mother of the 25-year-old Anna Eglitzky who had invited me to stay there. Anna is currently a English teacher at the Queensland College Of English in Tweeds Head and would be home around 7pm. In the state New South Wales (NSW), where I have been travelling through since Sydney, I stay in the +10 hours GMT time zone, as it is adjusted to summer- and wintertime. In Queensland, the northeastern state, they don�t need summertime-schedules, as there is enough sun all year long. In Queensland it is only +9 hours GMT. This all means that here in Fingal Heads, NSW, is one hour later than in Queensland. For Anna, who works in Queensland, this means that she works on Queensland-time, while living in New South Wales. That�s why she works until 6pm in Queensland, but until 7pm in NSW-time. However she can sleep in an extra hour, because 8.30 is 9.30 in NSW. When I�ll move up into Queensland I�ll gain one extra hour. However next Sunday the whole world on wintertime will adjust to summertime and there won�t be any difference between the Queensland time and the NSW-time. Anna�s mother caught up with me while having some drinks. She showed me around their Queenslander house (with the living areas most times on the first floor) and took me on the balcony that gave me a terrific view on a spooky dark blue lagoon, just next to their home! Ann works three nights a week in a nursery and for the rest of the time she loves to spend time doing crossword puzzles and having walks with their big dog Tyson. It was after 7pm when I met up with Anna, who was tired after a long day teaching English to a group of Japanese students and private lessons with a rich Czech man. Ann had made a good beef dinner with garlic salad en potatoes and during dinner Anna jumped loose with fascinating stories about her previous travel life. When she was young her parents took her along to Europe where the family travelled around, she spent one year as an exchange student in the United Kingdom of Great Britain, then decided to discover Asia and finished in Madagascar last year. It took a while before our plates where empty because Anna was telling me this fascinating story about her worst three days on this big island Madagascar, the former French colony, east of the South African coast. The problem wasn�t only the French language which Anna didn�t know at all, but it was more the fact that any traveller in Madagascar is seen as a rich person. You don�t go there if you are not rich and a lot of people there try to make a lot of money because any tourist is rich in their eyes. Basically the blame is to be put on the French, as they are rich and pay for anything, no matter how much. Which spoils it for the backpacking tourists like Anna, who is crazy about reptiles and just wanted to visit the National Parks of Madagascar. And the best way of transport in Madagascar is by plane, but, boy!, is it hard to get on a plane there! Listening to Anna I wouldn�t survive in such a country if I would only depend on hitchhiking. And even when you pay for a plane ticket, it won�t assure you that you actually can board a plane. The booked plane might even not exist. Good publicity for Madagascar, I must say. Not! After dinner (I wasn�t allowed to help the family with the dishes), we watched some television, fought with the dog and helped Anna by being one of her Japanese English students as I had to do some geographical test about Australia. I can skip the class with my A+! It was around midnight when everbody had gone to bed. Anna had to work again tomorrow and mother Ann would enjoy a free day tomorrow, but had to work her nightshift tomorrow night. And I just logged on my computer and did some last works before heading off to my guest room. Tomorrow will be relaxing as Anna offered me to stay another day of pure relaxing and doing nothing. Wow, that was just what I needed!